Global demand for disposable medical supplies is forecast to expand 6.1% per year to $314 billion in 2022. Growth will be driven by aging populations, upward epidemiological trends, a rising volume of patient activity, improvements in developing world healthcare systems, and the adoption of stricter healthcare infection prevention protocols throughout the world. Surgical instruments and supplies will account for the largest share of revenues based on the product-intensive and stringent infection prevention requirements of operative procedures. Dialysis disposables will register the fastest revenue growth based on an expanding base of end-stage renal disease patients who require frequent blood cleansing treatment. Asia/Pacific will generate the largest and second-fastest growing demand for disposable medical supplies among the world’s regions, reflecting evolving healthcare trends in its developed, emerging, and developing economies. Africa/Mideast will post the fastest regional growth for disposable medical supplies as countries expand and upgrade healthcare sectors. Led by the well-funded, advanced healthcare system of the US, North America will continue to form the second-largest regional market for disposable medical supplies over the long term. Based on their central role in medical delivery systems, and infection prevention needs of inpatient services, hospitals will remain the largest market for disposable medical supplies globally, accounting for 58% of 2022 global demand value. 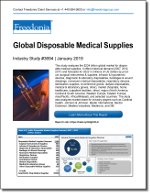 This Freedonia industry study analyzes the $234 billion global disposable medical supplies market. It presents historical demand data (2007, 2012, and 2017) and forecasts for 2022 by product, including surgical and medical instruments, infusion and hypodermic devices, diagnostic and laboratory disposables, bandages and wound dressings, nonwoven medical disposables, respiratory devices, sterilization supplies, incontinence goods, dialysis disposables, medical and laboratory gloves, and other products. The study also evaluates global disposable medical supplies demand by market (hospitals, home healthcare, outpatient facilities, and other markets) and region (North America, Central and South America, Western Europe, Eastern Europe, Asia/Pacific, and Africa/Mideast).